US-led strikes on Syria: What was targeted? The US, UK and France say their air forces and navies have conducted strikes on several sites in Syria, firing 105 missiles.US Defence Secretary Jim Mattis said the allies had taken "decisive action" against the Syrian government's "chemical weapons infrastructure".The strikes took place at about 04:00 local time (01:00 GMT) on Saturday, a week after a suspected chemical attack on the then-rebel-held town of Douma, which opposition activists, medics and rescue workers say killed more than 40 people.President Bashar al-Assad's government has denied ever using chemical weapons, and its key ally Russia says it has evidence the Douma incident was "staged". The Syrian government insists its entire chemical arsenal was destroyed under a deal signed after an attack in 2013 that involved the nerve agent Sarin. However, experts from the UN and the Organisation for the Prohibition of Chemical Weapons (OPCW) have ascribed four chemical attacks to the government since then, including a 2017 Sarin attack on rebel-held Khan Sheikhoun. The branch of the Scientific Studies and Research Centre (SSRC) in the capital's northern Barzeh district was a "centre for the research, development, production and testing of chemical and biological warfare technology", Gen Dunford said. Lt Gen Kenneth McKenzie, director of the US military's Joint Staff, said 76 missiles were fired at the facility - 57 Tomahawk cruise missiles and 19 joint air-to-surface stand-off missiles. "Initial assessments are that this target was destroyed. This is going to set the Syrian chemical weapons programme back for years," he said.The Syrian state news agency reported that several missiles hit the SSRC facility, "destroying a building that included scientific laboratories and a training centre". The SSRC is a government agency that is officially tasked with advancing and co-ordinating scientific activities in Syria.However, a Western intelligence agency told the BBC in May 2017 that the SSRC branch in Barzeh - along with two others in nearby Dummar (Jamraya) and in Masyaf, in Hama province - were being used to produce chemical and biological munitions in violation of the Chemical Weapons Convention (CWC). The agency alleged that the Barzeh facility specialised in installing chemical weapons on long-range missiles and artillery, and that manufacturing and maintenance of the munitions was taking place in closed sections that were not accessible to OPCW inspectors. Gen Dunford said the facility, about 7km from the storage site, "contained both a chemical weapons equipment storage facility and an important command post".Gen McKenzie said seven SCALP missiles were deployed and that the bunker facility was "successfully hit". Gen McKenzie said initial indications were that the objectives were "accomplished without material interference from Syria".The attacks on multiple axes by US, British and French warships and aircraft "were able to overwhelm the Syrian air defence system". "We are confident that all of our missiles reached their targets. At the end of the strike mission, all of our aircraft safely returned to their bases. "Gen McKenzie said the US military assessed that more than 40 surface-to-air missiles were launched by Syrian government forces. "Most of these launches occurred after the last impact of our strike was over," he noted, adding that it was likely most of the missiles were fired without guidance. 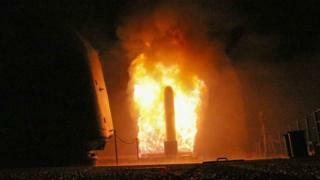 What does Russia sayHe said preliminary reports suggested 103 cruise missiles were launched. "Russia considers the strike to be a response to the success of the Syrian armed forces in fighting international terrorism and liberating its territory, rather than a response to the alleged chemical attack," Gen Rudskoi said.